Evil Geniuses won the fifth annual Dota 2 International tournament. The North American team defeated the Chinese CDEC in a 3-1 best-of-5 Grand Finals series, taking home $6.6 million out of a whopping $18.3 million prize pool. 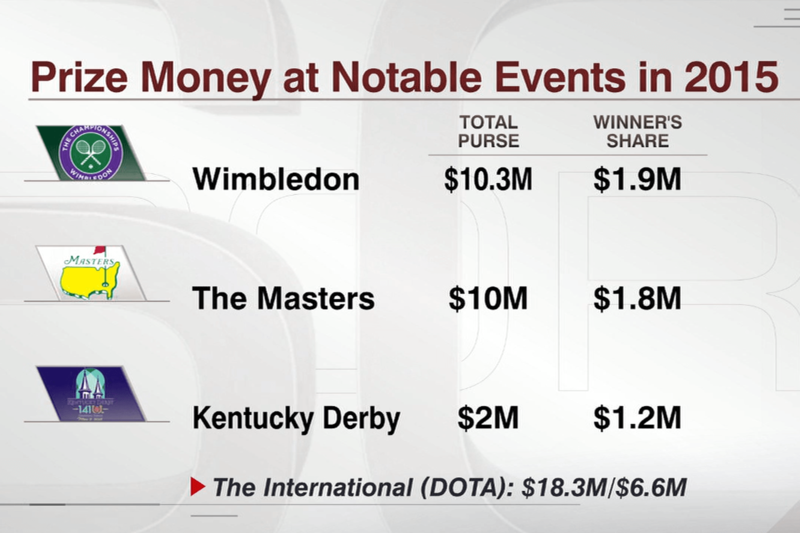 That is substantially more money at stake than at Wimbledon, the Masters, and the Kentucky Derby, as ESPN’s SportsCenter pointed out in its befuddled-but-earnest coverage of the event. The sporadic mainstream media coverage of eSports over the past few years, provided as the field has grown too large to ignore entirely, has often been dismissive in tone. This snide segment on the 2013 League of Legends world championship from Real Sports with Bryant Gumbel was rife with quips about Star Trek. One panelist immediately writes it off as a game and not a sport, without ever offering any explanation concerning that famously non-obvious distinction. ESPN’s segment is just as inexpert, but the anchors express genuine curiosity about what the game is and why so many people are so excited about it, which is a small but positive step toward eSports achieving some degree of mainstream legitimacy. Leading with the money as a natural hook, they bring in Seattle news anchor Kaci Aitchison, who covered the International over the preceding few years as a presenter and reporter, to explain the game and the event. Aitchison outlined the basic rules and structure of the game, emphasizing its strategic complexity, the variability created by the range of characters, and the amount of dedication required of its players to compete at this level. She goes on to explain how the prize pool was generated by the community through purchases of in-game items. As someone who was equally in the dark about eSports before covering the event, Aitchison is a perfect bridge into understanding the game for the anchors whose video game references go no further than Pac-Man and Centipede. The conversation should ring familiar to anyone who has tried to explain modern technology to older, less savvy, but well-meaning relatives. While this doesn’t mean that ESPN will be hiring a dedicated eSports commentator any time soon, it’s a step in the right direction. The network regularly covers poker, after all (and is that any less or more of a sport? ), and The International has drawn comparable viewership to the World Series of Poker in recent years.